North Port Aquatic Center at Butler Park is becoming a reality. Groundbreaking for the new facility is scheduled for 9:00 in the morning of July 7, 2018 at Butler Park. The North Port City Commission had voted to approve the initial concept for the North Port Aquatic Center on May 22, 2017 with a 5-0 vote. After extensive planning, the commission approved a construction contract with Recreational Design & Construction, Inc. on June 12, 2018. The cost of the project will be about $12 million. 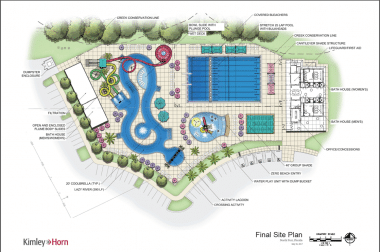 The facilities will include a lazy river, a kids activity pool with zero entry, two body flume slides, a bowl slide, shade structures, a bath house with locker rooms, a small concession area, fencing, and more. There will be a 25-meter stretch pool at North Port Aquatic Center able to accommodate 25-yard or 25-meter lap swimming and competitions. The pool will be located at Butler Park playground and the playground will be relocated to another area of the Park. It is hoped the pool will open in July, 2019. North Port FL is a great place to live. If you are thinking of buying a home in North Port, LF there is no better time than now. The area is growing and the community enthusiasm and pride is showing throughout the city. Prices are certain to go up with construction costs and demand. City infrastructure and parks like North Port Aquatic Center will continue to make North Port even better in the future. For information on buying single family homes, condos or vacant land building lots in North Port, FL, visit our website: North Port Florida Real Estate. For more information about North Port or the surrounding communities of Port Charlotte, Punta Gorda, Venice and Rotonda, call or email Your Suncoasteam.